I’ve always had a soft spot for Stillframe, since becoming acquainted with their music late 2004, due to a combination of an uncommon vocal sound, first-rate songwriting, and the band’s intense level of professionalism. Appetizer is no exception, improving upon past pieces, adding levels that further display their emotional connection with, passion for, and musical proficiency in their work. The CD starts off with It’s Over Now, a high-energy piece that shoots you right into the emotional roller coaster that is Appetizer. Far Away is the best display of Brad’s distinctive vocals, and the most mellow of the songs displayed on Appetizer. My personal favorite is Never the Hero, a piece that represents, in my opinion, the best collaboration between each member of the band, giving a completely unified sound, and with lyrics that will appeal to anyone who’s ever wanted anything significant in their lives. Appetizer is technically sound, and combines intelligent lyrics with Brad’s vocals (slightly reminiscent of Billy Corgan, but minus the over-dramatic nature) to bring listeners a musical emotional outlet that we can all use from time to time. As Brad says in The Taste, “I want this so bad, I can taste it. I know someday, I will make it,” I’m confident that these guys will. 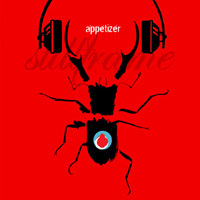 Be sure to check out Appetizer.